Built around the values of youth and commitment, the new-look Indian team is riding a mini wave in the SAFF Championship. The Indian side, coached by Stephen Constantine, will fall back on their greatest asset - the enthusiasm and energy of the young players - when they clash with Afghanistan in the final of South Asian Football Federation (SAFF) Cup at the Trivandrum International Stadium on Sunday, 3 December. Afghanistan, the defending champions, have consistently proved to be a formidable challenge to India in the SAFF Championship. In 2011, India rode on Sunil Chhetri's hat-trick to blank Afghanistan 4-0 to win the championship in New Delhi. Two years later, in the final at Kathmandu, the Afghans exacted sweet revenge and pipped India 2-0. Only five players - Chhetri, Jeje Lalpekhlua, Arnab Mondal, Subrata Paul and Robin Singh - from the fateful 2013 finale feature in Constantine's current team. Although Afghanistan has surpassed all teams in terms of goals scored in the tournament, India too posses a potent strike-force upfront. Despite the absence of an injured Robin Singh, who scored a couple of times in the initial games, India have enough firepower in attack to rattle the opponents' defence. Chhetri finished 2015 as India's top scorer with six goals. The skipper is expected to lead from the front - something he does often - while the in-form Jeje, who struck twice in the 3-2 semifinal win over Maldives, has been and is expected to be a perfect partner in attack. Chhetri and Jeje will be supported by Holicharan Narzary and 18-year-old Mizoram striker Lallianzuala Chhangte. 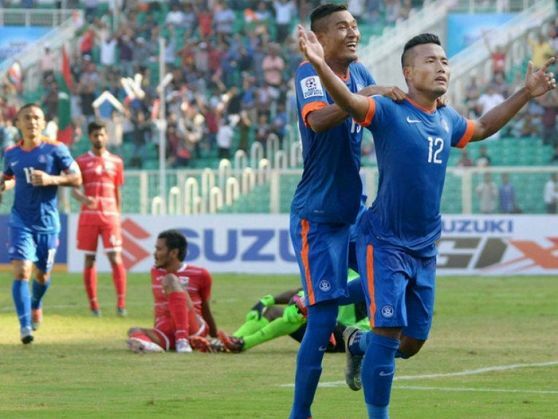 Chhangte - who is rated highly by his teammates - burst into the limelight when he scored two brilliant goals after coming on as a substitute in India's win over Nepal in the league stage. Having earned praise from Constantine for his performance, Rowlin Borges will be a key figure in midfield - although he is relatively inexperienced. Borges will have the dynamic Eugeneson Lyngdoh as partner in the middle of the park. With Bikash Jairu effectively using the width on the left, the British coach will have a decent midfield at his disposal. Having netted 16 goals in four matches with striker Khaibar Amani leading the way with five strikes to his name, the Lions of Khorasan present a formidable attacking unit. They trounced Bangladesh 4-0 and Maldives 4-1. Taking into account Afghanistan's potent attack, the Indian back-four of Pritam Kotal, Arnab Mondal, Augustine Fernandez and Narayn Das will be severely tested in the title clash. Afghanistan enjoyed more possession in the 5-0 drubbing of Sri Lanka in the semifinal, and made good use of the flanks through Zubair Amiri and Omid Popalzay. India also enjoyed a clear edge over their opponents for a major part of the match, but they were guilty of wasting many chances and almost let Maldives claw their way back into the game. A triumph tomorrow will be a sort of consolation for the Indian team after its disastrous outing in the 2018 FIFA World Cup qualification.